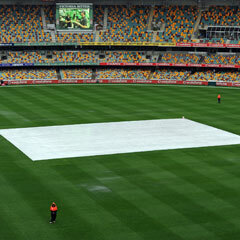 Brisbane - The entire second day's play in the first cricket Test between Australia and South Africa was washed out in Brisbane on Saturday. Match officials called the day's play off at 08:00 (SA time) after the pitch remained under covers throughout the day. The last full day's wash out at the Gabba ground was back on November 29, 1983 on the final day of Australia's second Test with Pakistan. South Africa went to Friday's first day stumps at 255 for two with Hashim Amla not out on 90 and Jacques Kallis on 84 after winning the toss.